It is mating season for harbor seals and for some reason they are coming into the harbor to hang out and birth pups. Naturalists guess that there is an increased predator population in unprotected waters making it too dangerous to be out there. The seals completely cover a dock finger, sunning and rough housing, until it twists and breaks off from the thousands of pounds of seals jumping up and down on it. 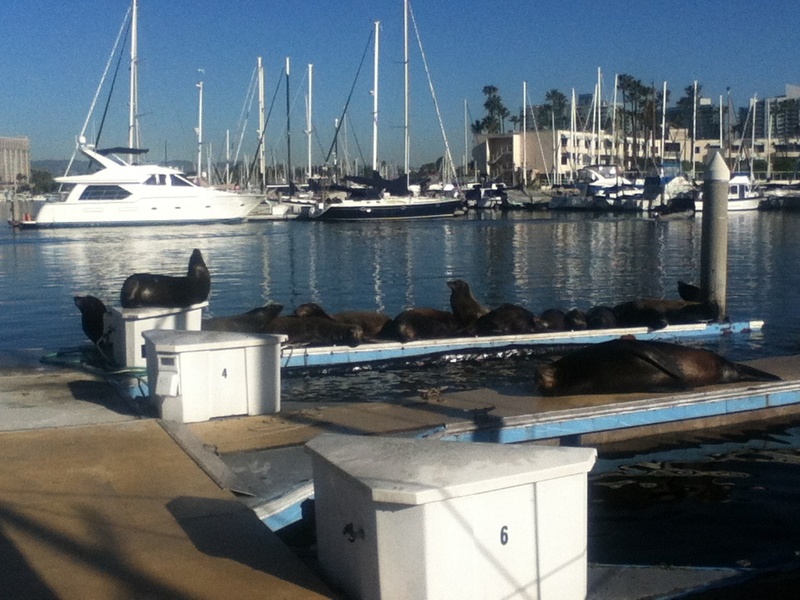 The docks are slated to be replaced anyway, and the seals are hurrying the process along. What’s really scary is when they get on the boats nearby. They are protected by law but people still hose them and yell while menacing with a stick or flag. The seals are undaunted. Austin seems to realize he is outnumbered and so has cut down on the bark fest when he sees the seals. At night, packs of 20 seals or so swim by at high speed chasing fish. 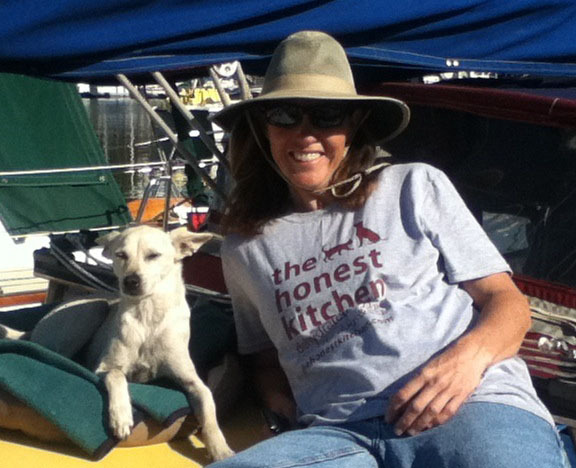 They create strange bubble noises under the boat, sometimes hit the keel (ow!) and toss the boat around as if a power boat went by at 10 mph. The rushing water sound of their big bodies is punctuated by the heavy plunge of Pelicans diving for their dinner in the dark. Austin’s dinner is far less challenging. He continues to recommend Honest Kitchen dehydrated human grade food. He makes me wear their shirt when we go to dog parks to let his new friends know why he looks so handsome and healthy. This entry was posted on Friday, March 1st, 2013 at 2:16 am and is filed under Dogs and Wildlife. You can feed this entry. You can leave a response, or trackback from your own site. Great to see your OK. Hadn’t heard about you two since Feb 8th. What are you doing besides watching seals?